Scorpio Bulkers Inc. announced yesterday that the Company has entered into a financing transaction in respect of one of the Company’s Ultramax vessels with an unaffiliated third party. 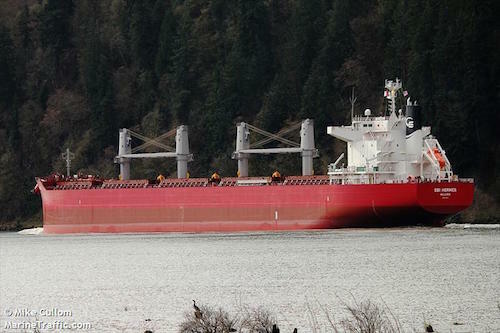 As part of the transaction, the Company will sell a 2016 Japanese built Ultramax dry bulk vessel, SBI Hermes, for a consideration of $20.5 million and then lease it back from the buyer through a five-year bareboat charter agreement at a rate of $5,850 per day. If converted to floating interest rates, based on the expected weighted average life of the transaction, the equivalent cost of financing at current swap rates would be LIBOR plus 1.39% per annum. The transaction also provides the Company with options to repurchase the vessel beginning on the third anniversary of the sale until the end of the bareboat charter agreement. This transaction, which shall be treated as a financial lease for accounting purposes, increases the Company’s liquidity by approximately $11.3 million after repayment of the vessel’s existing loan.